"I just want guys in the league to be happy where they're playing." 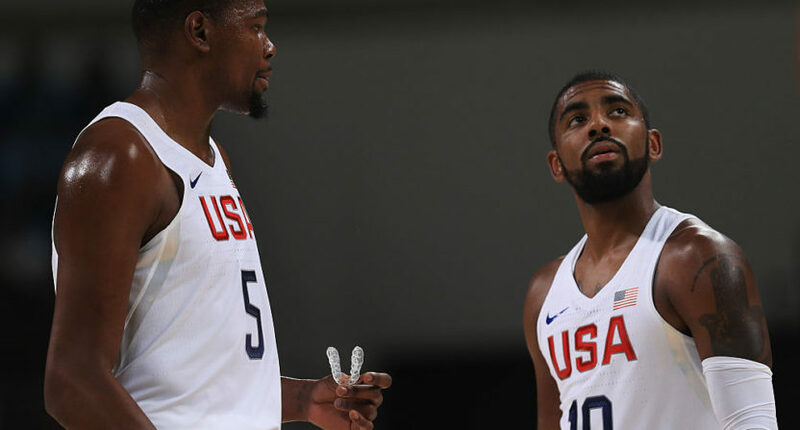 Kevin Durant is on the other side of the world for the NBA Academy India in Noida, so he understandably isn’t focused too intensely on the Kyrie Irving trade sweepstakes. But that didn’t stop reporters from asking him about it, and Durant gave an answer that makes complete sense given his own past. Durant said he wants Irving, and ultimately any NBA player, to find a team where he can be happy. “I really don’t care about the Kyrie Irving situation,” Durant said at a news conference Friday at the NBA Academy India in Noida. “I just want guys in the league to be happy where they’re playing and have some fun playing ball. While Irving has reached three straight NBA Finals with the Cavaliers, he demanded a trade earlier this month, catching LeBron James by surprise. Unsurprisingly, the four-time All-Star and former No. 1 pick has over a dozen suitors, but he reportedly wants to land with the Knicks, Spurs, Timberwolves, or Heat. There have been tons of reports circulating about the situation, from LeBron wanting to beat up Irving to Irving wanting out because he’s jealous of point guards like John Wall and Damian Lillard, who get to run their own team. Whatever’s going on behind the scenes, it appears almost certain Irving will not play in Cleveland next season, as he and the Cavs have reportedly not been in communication. Last offseason, Durant left a title contender, the Thunder, in free agency to join the Warriors, where he won a title and now appears as happy as ever.